Originally released as a limited 7" on the band's own WAU RECORDS label, this WAU Y LOS ARRRGHS!!! single sold out in a flash at their farewell gig in May 2017. Copies of the OG press are selling for stupid bucks online, so we reissued it, this time around with brand new cover art from Canuck lo-brow illustrator hero Darren Merinuk, and souped up vinyl mastering by Crypt Records honcho Tim Warren. 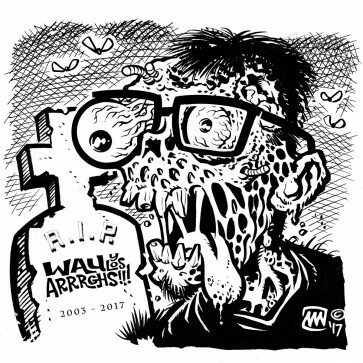 BONUS FEATURE: these are, without a doubt, two of the most action packed punk blasts we've ever heard from Wau and the gang, and it's now available again, worldwide for the first time, at the nice price. Black vinyl version.